* Maintain continuity of style. This page looks at landscape mulches - gravels, forest barks and associated fabrics. I compare their properties, uses, and describe how to apply them. You may want landscape mulch to enhance the soft landscape around your house and along pathways. Crunchy gravel for example is well-used on house approaches to provide an alert to the presence of visitors. Well-chosen stone colours can blend beautifully with house walls, rock and water features and the local natural environment. 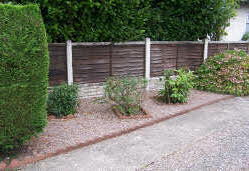 Further from the house permanent planted areas such as shrubberies and rock gardens are good sites for landscaping. Mulch can set the tone here too and provide a neat low maintenance area. Organic cocoa shell and bark for example add aroma, and the essence of a natural forest setting to your garden experience. These landscape mulches add continuity, colour, and texture. Don’t’ forget that the size of stones, chippings etc... influences the awareness of space within an area. It is common practice to underlay these materials with a landscape membrane or geotextile. This forms a permeable barrier. But with organic mulch - wood chip, bark and the like, this is not necessary as these rot down to feed the soil. My natural instinct is to avoid barriers that cut off the soil, worms, and soil microorganisms etc… from the surface. However, with the harder and heavier gravels and stones, a membrane prevents sinkage into the lighter soil base and the soil base from rising into the gravel layer. This is especially important when the gravel is used to carry traffic. The landscape mulch itself will suppress weeds by blocking out light and, because they are dry and sterile. But if your soil base is populated with pernicious perennial weeds like Horsetail, then a barrier membrane can save you using weed killers or digging them all out. Previous advice typically stated that weeds should be removed before applying a loose mulch. But nowadays membranes can take care of that problem. But if weeds were to seed into the mulch and grow from the top down, their roots might penetrate any permeable underlying barrier. This complicates weeding as it may tear the membrane. The advice on this says - don't exceed the recommended depth of mulch (details below). A barrier membrane also prevents tree roots from growing up into a loose mulch. Landscape mulches also keep the underlying soil cool and moist during summer. You can usually find a way to plant through landscape mulches. Under gravels that will require cutting through the barrier membrane. Therefore it’s best to plan your planting scheme before you start and cut an X through the membrane wherever a plant is to go. Larger sized wood chip has an advantage over bark of being less likely to be blown away. Nowadays a range of decorative wood chips are made for gardens. The depth of mulch for paths should be around 50mm. For children's play areas it should be around 300mm and geotextile under membrane may also be considered. 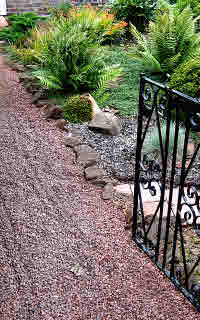 Gravels can be used with planted garden areas: borders, cottage garden paths, rock gardens, around water, and to make stone features. Gravel can also be used for utility areas: in greenhouses, access paths, drives and parking areas. You may find that small sharp gravels and grit deter slugs. But some gardeners find that small polished gravels are used as a toilet by cats. Gravel size is an important factor influencing texture and awareness of area. Think about scale. Small areas can look more extensive when a small size gravel is used. But the scale of plants, rocks, and other features also play a part. In utililty areas the gravel should be at least 6mm in size to prevent it being kicked around. The largest size that is comfortable for walking on is about 20mm and 10-20mm grade might typically be used for driveways. Details on drive construction are beyond the scope of this website. But the gravel layer for a typical garden path might be around 30-40mm deep. Flat stones of shale or slate add a another interesting perspective to the ground. They are typically used on a scree garden. You may consider shale or slate as landscape mulch for your paths. The problem with block paving and concrete paths is they prevent natural rain seepage and cause run off. Also, they are not very desirable to someone who enjoys diverse greenery. This section is about garden friendly utility landscape surfaces - alternatives to landscape mulch. Nowadays several permeable alternatives are available. Block-block contact or block-spacer-block contact is important for structural integrity of the surface. Also important (as in all block paving) are the base and where necessary the sub-base material. The small planting spaces (greater with block spacers) and low nutrient content of the block base mean that grass can be short lived. Use an organic soil mix in planting pockets and, water and fertilize regularly. Cellular Paving using hexagonal polypropylene units that interlock. These units protect the planting pockets and allow for bigger planting and sowing spaces. You could use the above systems with any suitable plants in addition to grass. May I suggest clover or medicago, as these will fix the nitrogen into the soil helping to feed the grass. Ajuga, Lamium, and the scented Anthemis nobilis (Chamomile) are other possible choices. Rye grass is of course the toughest for a utility area. Grass Protection Mesh - this is pegged down over grass in parking areas and can prevent rutting and muddying of the turf. Soil Retention / Protection Mesh and Blankets - these are made of natural materials and biodegradable. They hold the soil in place reducing erosion before grass germinates and establishes. Grit and gravel are also used to top off pots and containers. They act as mulch to keep the pot soil surface moist and they suppress weeds. Planting pockets in patios and pavement, and along walls and paths are also nicely finished for with ornamental gravel mulch.